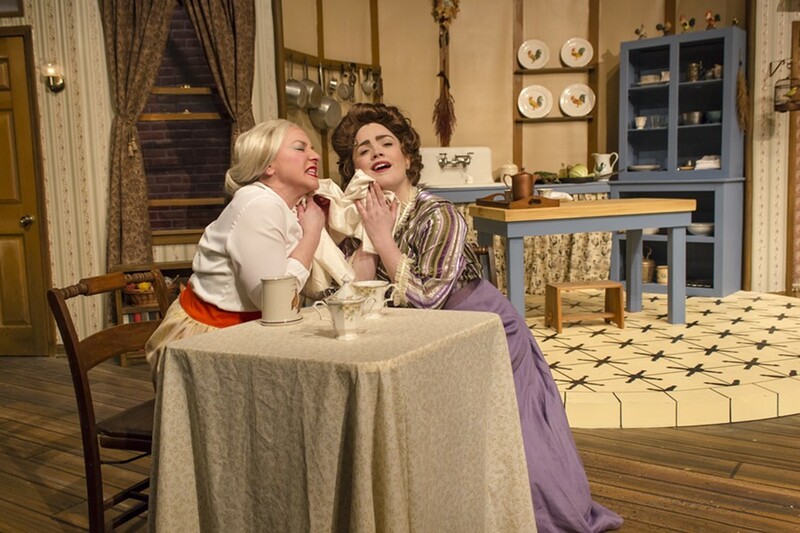 Dawn Sargent and Jillian Severin in "The Underpants," onstage at Blackfriars Theatre through this weekend. The topic of feminine undergarments has fascinated humans for centuries, dating back to a time when a pair of "underpants" contained more material than a pair of modern shorts. In many ways, the intimate garments represent vulnerability, gender roles -- and an excellent opportunity for social commentary. That's what German playwright Carl Sternheim believed, anyway, when he penned "Die Hose" ("The Trousers") in 1910. Almost 100 years later, "Die Hose" was adapted by Steve Martin -- really, is there anything he can't do? -- and renamed "The Underpants." The show opened Off-Broadway in 2002 and has since been produced around the world consistently. The play begins in the flat of Theo and Louise Maske. The couple has just returned from attending the King's Parade in Dusseldorf on a Sunday afternoon, but alas, tragedy descended upon them during the event. While Louise was climbing to have a better vantage point of the royal procession, her underpants loosened and slipped down around her ankles. Now, her proper German husband believes his wife's reputation (and therefore his) is ruined. While Theo panics and tries to restore order, happy-go-lucky Louise is encouraged by their upstairs neighbor, Gertrude, to enjoy her newfound fame and all that comes with it, including the attentions of two would-be lovers who are interested in renting the couple's available room. As many Blackfriars show selections do, the production features an intimate cast (just six players), but plenty of talent abounds in this lineup. Director David Henderson (of local company Method Machine) is mindful of the play's thematic elements and guides the actors in a delicate exaggeration of their characters, stopping appropriately short of creating caricatures. Adam Petzold (Theo), who appeared in "The Boys Next Door" earlier this season, plays the alpha male, a proper German husband who's committed to providing a good home for his beautiful wife. Early in the play, he admits Louise's looks are out of his league, and he spends a lot of energy compensating for this blow to his confidence. The sinewy Petzold portrays the mansplaining, machismo role to perfection. Opposite him is Jillian Severin (Louise), a bright-eyed, rosy-cheeked beauty versatile enough to play a Disney princess -- or, in this case, an obedient German wife who spends her days making dinner for her husband and her nights pining for a little excitement. Dawn Sargent (Gertrude) plays the couple's nosy, older upstairs neighbor who wants to live vicariously through the vibrant Louise. Gertrude makes way for many of the tongue-in-cheek innuendos throughout the show, ranging from an "erect" tower of whipped cream to a pan of sausages arranged with two small "potatoes" each. As Louise's star struck lovers, Daniel Mejak (Benjamin Cohen) and Jonathan Porter (Frank Versati) are responsible for much of the show's hilarity. Mejak plays a milquetoast Jewish barber who convinces the wary Theo it's "Cohen with a K," and Porter plays a preening, simpering poet who believes he's found his muse in Louise. A scene where a sleepy Mejak climbs the flat's stairs kept audience members laughing until they broke into applause. Andrew Cowen (Klinglehoff) plays a smaller role as the final tenant, but still adds to the overall comedic strength of the cast with his facial expressions, in particular. The scenic design by Mara Bianca, which depicts a turn-of-the-century European flat, is aesthetically impressive (and perhaps the most ambitious of this season). Costume design by Janice Ferger channels further innuendo, particularly through Louise's -- ahem -- liberated dresses. "The Underpants" is a fun romp through issues of gender roles and responsibilities without feeling too heavy-handed at any point. The farce celebrates what has changed in the last century even as it exposes what hasn't. For many audience members, it might be too subtle a theme, but for others, it has the potential to create stimulating post-show conversations.